$1,999.00 & FREE Shipping on orders over $59. 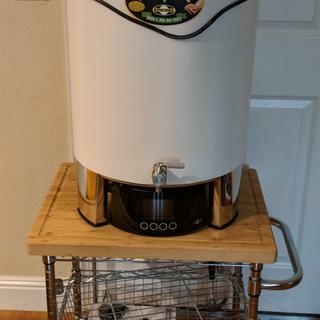 The Braumeister is an all-in-one, electric all-grain brewing system that will ship to you free of charge from MoreBeer!. Made by our long time business associate Speidel of Germany these systems are imported and supported in USA by MoreBeer!. 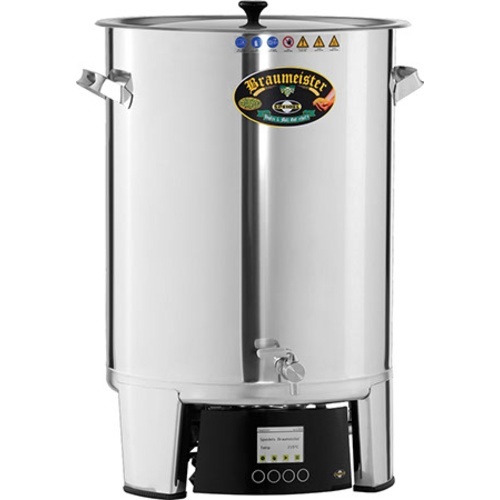 The Braumeister features an automation and ease of use that is unparalleled in brewing all-grain beer at home. Plus we love the quality of beer produced on these machines. On top of all the features that Braumeisters are known and loved for, 2015 has brought an update to the user interface on these units. The new control panel showcases a large LED screen, allowing for easier recipe viewing and manipulation, as well as a memory bank to actually store recipes for future brews. Speidel has also been planning for the future with these new control panels. Aside from immediate benefits, there is hardware to support WiFi control and other functionality that will be released as software updates to existing units. The Braumeister Control Module is available now, and when purchased, will upgrade your Generation 2 Braumeister to be controllable over the Wifi network! First the system is small in footprint and powered by electricity allowing you to brew inside, in a confined space, without the fear of carbon monoxide gas from a flame source. Secondly this unit is very easy to use as you mash the grain and then boil the wort in the same vessel. We also love the automation and control. Before you brew you set the controller with the different temperatures you wish to attain (advice is given on what to set) and the built in heating element and pump do the rest. The Braumeister is especially ideal for step-mashing, which many brewers think is the preferred way to brew lager beers. Based on the results of lagers we have brewed on this machine MoreBeer! agrees. On Brew Day you are going to assemble your Braumeister with the mash tub and bottom screen. You will fill the unit with filtered water to a notch on the center post - easy. The controller reads in °C, and you can set it to different temperatures you wish to reach. Advice is given in the manual. When your water is the correct temperature a beep alerts you to add grain. Stir in your grain, lock down the top screen (so now there is a screen on the bottom and the top) and start the mash. During the mash wort is constantly recirculated through the grain bed from the bottom up, reverse of most typical systems. The liquid wort flows up through the mash and then cascades down between the mash tub and the outer wall of the Braumeister. There it is collected by the pump and pushed back through the mash. When the mash is complete, another beep will alert you to remove the entire Mash Tub, which sets on top of the Braumeister to drain for a period of time. At this point you can choose to rinse the Mash with hot water or to just add water directly the wort. Push another button and the boil starts. You program the length of the boil. When the boil stops insert your wort chiller and cool. This was our main question because with the Braumeister you are skipping a traditional sparge. The continual recirculation of wort during the mash results in a satisfactory efficiency. You need to have a source of 230 v power (and the ability to adapt the European plug to North American 230 v, we recommend a certified electrician). If you have that then using electricity can become an advantage. Because of size constraints of the mash tub the largest starting gravity beer you can brew is between 1.060 to 1.065. You can always add DME to the boil for an occasional big beer brew. You don't make a lot of high-gravity beers, and are willing to add a little DME when you do. 2015 Controllers can store up to ten recipes for easy rebrewing! Speidel Plastic Fermenter - 60L / 15.9 gal. what size tubing do you use to drain into the fermentor? BEST ANSWER: 1/2" but be careful the nozzle of the valve has a slight tapper and the hose could slide off. I had to jury rig a retaining wire over the top of the valve body and a clamp on the hose to keep it from sliding off under the extreme heat. I go through a plate heat exchanger before going to the fermentor. Brauwmeister does a wonderful job of making this unit but the valve needs a little more attention. The Braumeister spigot works best with 1/2 in. silicone tubing. It stays in place without a clamp. I run mine through a Therminator plate chiller first. Hi, I use 1/2” silicone tubing with a hose clamp. So happy to have this 50L Braumeister. It's beautiful, well build and compact. Perfect for a tight space for a home brewery. Integrates well with an overhead hoist to lift the heavy malt pipe. I love the advantages of this system: Small footprint, automation, quality, ease of use. If you’re not high gravity beer brewer this is a great option to consider. It is expensive but the high quality and details make it worth. Buy one. It is awesome. I upgraded from the smaller 5 gallons system and can now produce twice the volume in one session. It's so easy a caveman can do it. I really like brewing with this system. It is easy to program your recipes in. I use their default mash program and set my own boil times and hop additions. It is nice working off a program because while it is adjusting my temps for me automatically it allows me time to clean and sanitize my fermentor and clean up other things while it is brewing. it does a good job at extraction of sugars. you can still do high gravity beers in it , you just trade off 3 pounds of grain for D.M.E. and it comes out fine. only drawback would be lifting out the malt pipe, it is heavy filled with wet grain, cleaning the coils can be tough, but pbw will loosen up the tough stuff. makes great beer paired up with the morebeer heated/cooled fermentor. 5 star product. I have been using the 50L V1 for over a year. 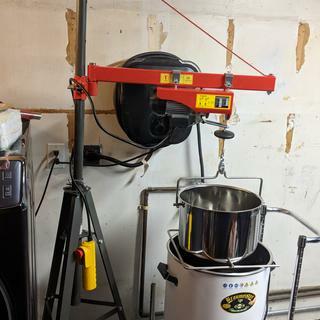 The best purchases I have ever made since home brewing.What an exact brewing machine.I also recommend trying their receipts which you can find on their web site.